QUICK JUMP: Contestants Pageant Information How to compete in Miss Reigning America 2019? Thank you for your interest in Miss Reigning America. Our pageant prides itself on being Fun, Fierce and Fabulous. We believe that our pageant should be family oriented so that everyone enjoys the time that they spend with us. We're so grateful towards everyone who chooses to compete in our system so we strive to treat each delegate and her family with the idea that the experience should be stress-free, fun for the entire family. 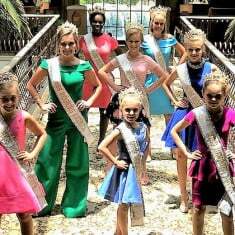 We are an affordable and all inclusive priced pageant. The Miss Reigning America Scholarship program will be held in Orlando, Florida on June 24th-28th 2019 and we will be at the incredible Universal Studios. There will be three fierce, fun and fabulous themed dinner parties, designed for delegates to meet new friends; no judges allowed! Room rates are $95.00 a night for suites, 9 pools, discounted park tickets, free shuttles and FREE PARKING. FAIR PRICING AND NO EXPENSIVE OPENING NUMBER DRESSES AT STATE OR NATIONAL PAGEANTS. 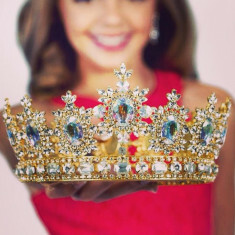 State pageants, Internet pageants and At Large Titles available in every state. Stoned sashes for all state and appointed queens along with our custom 5th year celebration crown.